With the future of federal corporate tax cuts playing a role in the election campaign, a new study says the planned reductions will not stimulate the economy. A new report from the labour-oriented Canadian Centre for Policy Alternatives, a non-profit research organization, suggests historic trends show businesses' fixed capital spending has declined as a share of GDP and as a share of corporate cash flow since the early 1980s, despite a series of federal and provincial corporate tax cuts. The study says the combined federal-provincial corporate tax rate has been cut to 29.5 per cent in 2010 from 50 per cent in the early 1980s. Conservative Leader Stephen Harper's plan to reduce corporate taxes further has become a flashpoint in the federal election campaign. The Conservatives plan to reduce federal corporate taxes to 15 per cent in 2012 from 16.5 per cent in 2011 and 18 per cent in 2010, while the Liberals and NDP both want to halt those planned cuts. Jim Stanford, the report's author and an economist for the Canadian Auto Workers, said in a report released on Wednesday that the Conservative government's proposed three-percentage-point reduction in corporate tax rates would cost Canadians $6 billion per year, but it would only create $600 million of new business investment annually. "Given this statistical evidence, the federal government would have a far more powerful impact on both public and private investment by investing directly in public infrastructure, rather than providing additional tax reductions for businesses," Stanford said in a release. The report, called "Having Their Cake and Eating It Too," says Canadian companies have received $745 billion in extra after-tax cash flow since 2001. The study said that cash has not been reinvested in capital projects. When companies failed to put the money they received in tax cuts back into capital projects, it served as a major source of Canada's economic downturn, the study indicated. "Corporate Canada has been consistently receiving far more after-tax cash flow than it is reinvesting in Canadian capital spending-to the tune of $745 billion since 2001," Stanford said in a release. "Supplementing that cash flow through further tax cuts is like pushing on a string. Those tax savings would only add to the large sums of uninvested cash flow Canadian businesses already possess." The future of the corporate tax cuts became an early flashpoint in Tuesday's English-language leaders' debate. Harper was criticized by his three political rivals over the planned tax cuts. The Conservative leader said he had a legacy of cutting taxes for both small and large businesses. He also tried to defend the tax cuts, saying they had already been passed and there were no new corporate tax cuts in his most recent budget. Liberal Leader Michael Ignatieff said Harper's explanation on corporate tax cuts continued to show he dodges the truth. "We're in the middle of the biggest deficit in Canadian history. You didn't tell the truth to the Canadian Parliament, you are the first prime minister to be found in contempt of Parliament of Canada," Ignatieff said. "Right now, you are trying to persuade Canadians that you are not cutting corporate taxes … and no one can understand why that makes sense when we are in the middle of the biggest deficit we've ever seen because of your waste and mismanagement." 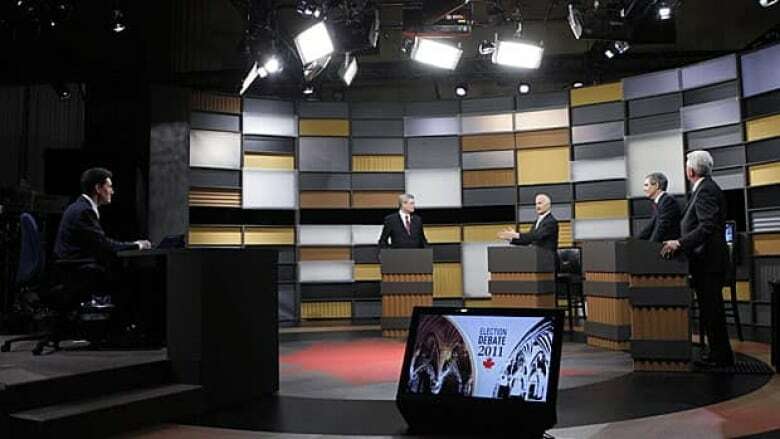 NDP Leader Jack Layton also criticized Harper's explanation on the tax cuts during the leaders' debate. "You try to claim there are no corporate tax cuts coming now. That is not true," Layton said. "Those cuts are still coming, and they are very, very costly."